Every time I look at Linked in or Twitter or listen to a podcast, it seems like someone is bringing up the fact that there aren't enough women in technology . See this Article from the Wall Street Journal, and this interesting article about diversity in technology from Recode. Wow! You guys asked 5 whole women! jk I assume (and hope) that they found women other than the top 5 female execs in the world, but let's just say it wouldn't surprise me if it didn't extend too far beyond this. After the scandals that they had, it's no wonder that they could no longer attract 'top' female talent, and I guess they just couldn't find a single woman of any quality (sarcasm) to fill the position because Uber's board ultimately voted (unanimously) on an Iranian-American male, Dara Khosrowshahi to be the new CEO. Sexism extends far beyond executive positions in technology, and is obviously a larger problem than just one company or one blog post. However, I heard something recently that really made me angry and I wanted to address it because it's something that we all could potentially correct. The first step in fighting our implicit biases is to become aware that they exist. Especially when it is disguised as something else. I was having a discussion with some data science peeps and we were talking about resumes and gaps in people's work experience. While looking at one resume someone (man) said "What was he doing from 2001-2003? ", to which I replied, "Maybe he had a child. Maybe he was sick. Maybe he was in jail." Which was meant to be both funny and serious, b/c I try hard not to come off as the crazy person that I am inside. Then, another person (man) said, "When we were hiring at 'Company X' for a new data scientist we threw out any resumes that had a gap in their experience." What? Are you kidding me? This. Has. To. Stop. I understand that often men don't realize how sexist they are being, but it's time to wake up and be responsible citizens. You may be thinking, 'well, they needed to start somewhere, why not weed them out using gaps?' Let me womansplain it to you. Often in our society women are the caretakers. An estimated 66% of caregivers are female (2). Although men also provide assistance, female caregivers may spend as much as 50% more time providing care than male caregivers (3). There is a lot of data on this, and I have only listed a couple of sources. These stats are just in reference to caregiving for non-children (i.e., people who have illness, are aging, or living with a disability). It is statistically more likely that women are the people who take care of their family and friends if they need assistance. Women are still more often the primary caregiver for their children. Guess what happens to us when we need to take care of people? We often have to take time off from work. And although it's not legal to punish women for things like maternity leave, it absolutely happens all the time (I'm looking at you too, academia). If a gap in job experience is the reason you throw out 50% of your resumes, guess who you will be left with? Do you want to live in a world with healthy, educated, happy individuals? Then, you need to contribute to this society (that you already benefit from and live in, FYI). This means paying money for education even if you don't have kids, taking up the slack from the mom at work who is picking up her kids from school, voting for people who will protect our equal rights, slowing down in a school zone, etc... Yes, it takes a village to raise kids, and educated, healthy women and children are how you get a progressive society. If people are malnourished or poorly educated do you think we will have great advances in biology, technology, great art? The answer is no. 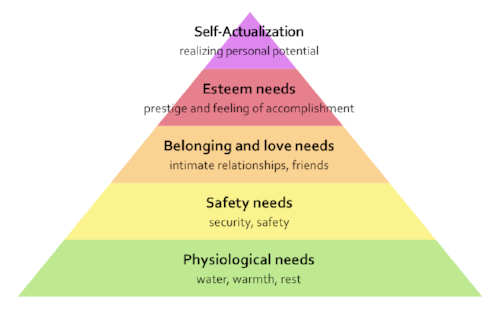 Just check out old Maslow and his little hierarchy o' needs. Let me know how much you feel like pontificating when you are so hungry you can hardly stand up or so malnourished that you can't get out of bed. People, including and especially women, need nutrition, healthcare, and quality education, and they need it the most from 0-5 years of age. The more we can support moms and dads who are caring for those babies, the better off we will all be. So, BE SELFISH by HELPING PARENTS so they can RAISE HEALTHY KIDS! Should I make a T-Shirt? It's pretty catchy, I know. Even Peg Bundy wasn't exactly a wealthy woman of leisure. Just because you have a 4 month or 2 year gap in your resume does not mean you aren't qualified. maybe it means you went back to school/training, or you had to work a crappy job for while to pay the bills and you don't want that job on your resume. What if it represents work that isn't relevant to the new job? Or you had a falling out with your boss, or were sexually harassed and don't want you to go and ask that person for a recommendation. I can think of so many (non-gender related) good reasons why someone might have a gap on their resume. And if they really were spending that time just sitting in front of the TV eating bon bons, so what? Does that mean they are lazy and will be a bad employee? Maybe it means that they needed a break and can now function at full steam? And don't worry, you can always do a nice little background check to see if they are a felon (another issue entirely, and one that I'm not fond of). “Minority candidates would not want to come to our campus.” The search committee should not make such decisions for the candidates, but should let the candidates decide if the campus and/or community are a good match for them. The search committee should show potential candidates how they might fit into our campus, provide them with resources for finding out more about our campus and community, and help them make connections to individuals and groups who may share their interests, race, ethnicity, etc. 2. The National Alliance for Caregiving and AARP. (2009). Caregiving in the U.S. National Alliance for Caregiving. Washington, D.C.
3. Family Caregiver Alliance. (2001). Selected Caregiver Statistics (Fact Sheet). San Francisco, CA.